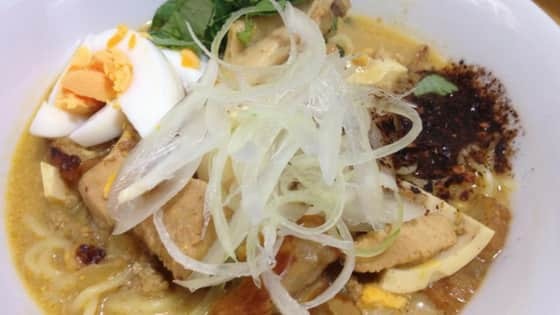 HomeBlog Khow Suey Knowledge What is the alternative to coconut milk to make Khow Suey? When the Khow Suey is served with coconut soup, it is called Ohn Noh Khow Suey. Coconut milk is normally used to cook Khow Suey but some people use half cream milk instead of coconut milk. When half cream milk is used to make Khow Suey, it is called Noh Sane Khow Suey. For people who are not family with Myanmar traditional Khow-Suey, it is not possible to distinguish between Ohn Noh Khow Suey and Noh Sane Khow Suey. The cooking process of Khow Suey remain the same and all the other ingredients are the same as well. Since the main ingredient is different in Ohn Noh-Khow Suey and Noh Sane-Khow Suey, both Khow Suey have different flavor. The taste of Ohn Noh-Khow Suey is quite heavy and this Khow Suey has strong smell of coconut milk. The taste of Noh Sane-Khow Suey is lighter and there is no special sweet smell. There are a few reason why half cream milk is the alternative to coconut milk while making Khow Suey. Half cream milk is a blend of whole milk and light cream, therefore it is thicker than the milk. The texture of half cream milk is similar to coconut milk as well. Since half cream milk is not too creamy like full cream milk, it doesn’t make the soup too thick. Therefore it is most suitable alternative to coconut while cooking Khow Suey. Coconut-milk is known to be unhealthy for people with heart-problems and hypertension. High amount of cholesterol in coconut milk can increase the risk of heart problem and stroke. The amount of sugar in coconut-milk is also higher than half cream milk, therefore it is high in calories as well. Even though both coconut-milk and half cream-milk are not good for people with diabetes, half cream-milk is better than coconut-milk. Moreover, coconut milk has more fat than half cream milk. Therefore, Noh Sane Khow Suey is a better choice for unhealthy people and people who are on diet. Just like coconut milk, ready made half cream milk bottles are also available in any supermarket and store. When adding to the soup while making khow suey, all you need to do is stair it well. You need to make sure the cream from the milk will not gather in one place. Two carton of half cream milk is enough for 5-7 servings.